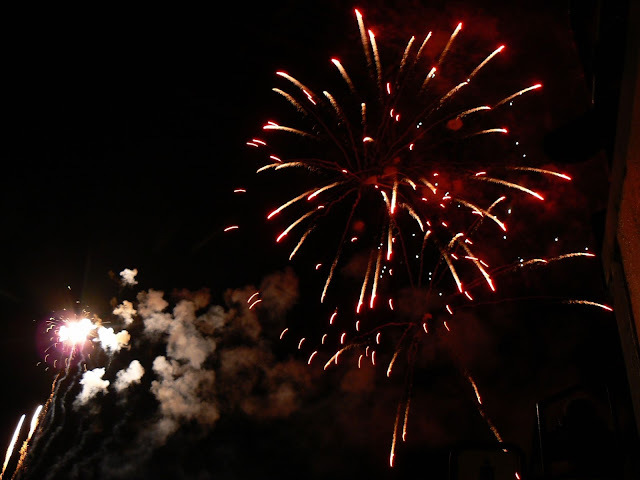 The Ninja Librarian: Happy 4th of July! 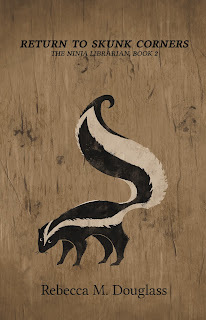 Just for fun...a little excerpt from the 4th of July in Skunk Corners, as the author is very busy just now and is already late with this post :D It's a little long, being a whole chapter from The Ninja Librarian, but it's good reading for this holiday! I have seldom enjoyed a meal as much as I did that Independence Day picnic. I sat with Tommy and Peggy, and it would be hard to say which of us ate the most. I’d never have believed kids their size could stow away that much food, though some of it may have ended up in pockets for later. Across from us, the Ninja Librarian ate with a restraint I could scarcely imagine. Either they teach an awful sort of self-denial wherever he learned to be what he is, or he’s a far better cook than I am. Or maybe not all those widows had given up. I was distracted from the thought by the appearance of another dish of potato salad. By the time we’d taken care of that, the mayor was up on the platform we’d built, and I napped a little while he ran on. An over-full stomach doesn’t make for a particularly attentive listener—any more than does an empty stomach. Sometime when I wasn’t half asleep, I’d have to think about that. Even the kids might have slept a bit, despite their excitement, because they’d run in the races before sitting down to lunch, and acquitted themselves right well—in the races as well as at the table. When Peggy had lined up to run with all the boys, a fair number of people had laughed. But she just ignored them, hitched up her skirts until the bottoms of her bloomers showed above bare legs and bare feet, and kept her mind on the job. When they rounded the corner at the far end, we could all see that two runners had pulled well ahead of the others. Someone hollered that it was a two-man race, just about the time we all saw that one of those “men” was wearing bloomers. Things got a bit quieter all of a sudden, but that didn’t seem to bother either runner. When Peggy crossed the line right behind Tommy—and ahead of everyone else—I collected a comfortable sum from those who’d been sure no girl could ever beat any boy. I’d figured both Peggy and Tommy were used to running from angry farmers and housewives. They stirred up some feelings on their foraging expeditions time to time. Besides, most of the other boys were hampered by having parents who made them wear shoes. So I’d bet on Tommy and Peggy as a one-two deal. Since bare feet were better for summer and races than winter and snow, I planned to use a bit of those winnings to buy Peggy and Tommy each a pair of shoes, come winter. The men’s race came off next, and they weren’t much faster than the boys. I guessed Tommy could have beat most of them, and maybe Peggy could have, too. The men around Skunk Corners tend to do their running a-horseback. Anyway, like I say, food and races and warm sunshine made sure we mostly dozed through the mayor’s speech, but when Tess Noreen, owner of Two-Timin’ Tess’s Tavern, got up to give her speech, I came right awake. I was almost holding my breath, if you want to know, seeing as how she was my idea. A sort of rumble and gasp went through the crowd. Murmurs of “a woman like that” and “how dare she?” came from the women, while the men made a noise more appreciative of what they saw, but not amounting to open admiration on account of the wives and respectable women all around them. Tess acted as though she didn’t notice a thing. She was dressed like she was for work, with maybe a bit more bosom showing than most of the women in town would’ve shown, but she wore it well, and the men noticed, like I said. Then the men realized the woman was going to give a speech, and their rumbles changed tone. For a minute, it looked like there might be a ruckus, but Tom touched his napkin to his lips, stood up, and began to move through the crowd. Here and there, where someone seemed unwilling to let well enough alone, his hand drifted toward the bit of black silk in his breast pocket, and folks sort of subsided. Most everyone in Skunk Corners knows that’s no handkerchief in his pocket. Even the folks who’d come in from farther out had heard about him, though they might not have believed all they’d heard. That brought a moment’s stunned silence, until, led by Mrs. Herberts, who’s run the tea shop all alone since her husband got himself killed by a bad horse, the women began to cheer. The men chimed in a bit belatedly, many following a good jab in the ribs from their wives, who seemed to have forgotten their objections to Tess’s business and attire. Again the crowd rumbled when Tommy and Peggy stood up and made their way to the podium we’d built the day before. Tommy stepped up to look over the crowd, pale but resolute. The mayor looked at his daughter, clearly wondering why she was not up there, but she just shrugged. I don’t think she minded. Marybeth knows her limitations. After one scared look over the audience, Tommy opened his mouth and began to recite, and you could hear him clear to the back of the crowd. “When, in the course of human events, it becomes necessary for one people…” When he finished he sat down amid thunderous applause. He hadn’t missed a single word or so much as stumbled. Peggy stood up and, not waiting for the inevitable murmurs of disapproval, launched right into Lincoln’s speech. You could hear her, too, right enough. Especially the part where she changed “all men are created equal” to “all people are created equal.” Fortunately, no one seemed to know it was a change, and she carried on without showing the slightest sign she’d done anything odd. When she came to the end, thunderous applause broke out. Peggy turned bright red and ran back to our table, where she hid behind me. Thus far, the day was a perfect success. 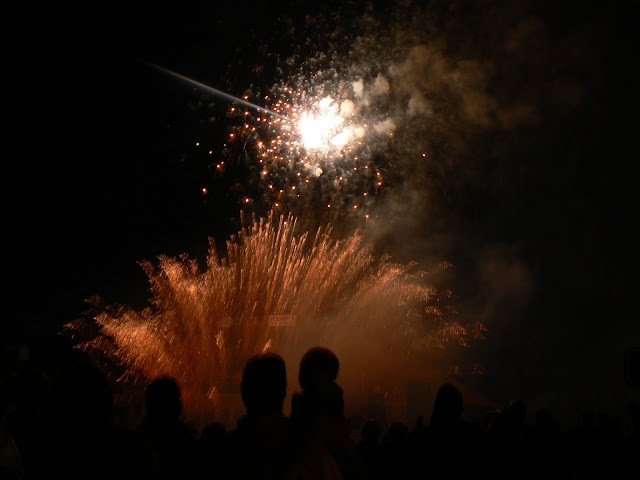 The children had been having a wonderful time, and had shown the grown folk that Skunk Corners could do this as well as anyone. We’d had races, speeches, and a picnic to remember. All that remained was the bonfire, but that would have to wait for evening. But after the speeches, something changed. Tess had begun serving at noon, her usual time, but she and her barkeep, Johnny, had been watching close and not letting any of the usual good-for-nothings get drunk. But someone else had less sense, or more greed, because by three or four in the afternoon, Crazy Jake, Wild Harry Colson, and a whole lot of out-of-town fellows were drunker than a prospector on a toot. It was Tess and Peggy caused the trouble, in a manner of speaking. Some of those boys just couldn’t stand the idea of women doing much of anything outside of what a man told her to do, and Cal Potts started shooting off his mouth about uppity women who wouldn’t keep in their place. He’s from Two-Bit, and probably only came for the drinking—and maybe for the fighting. I didn’t see the start of it, but the children told me about it. Seems Cal said Tess was no better’n she should be, which I figured was true enough and didn’t upset anyone. But he added that no one but a bunch of sissies would have put up with her suffragist nonsense. Well, Tommy Colson heard that, and said it was Cal who was full of horse feathers, because look at Peggy and you could see girls were just as good as men, some of them. The kids told it to me that way, though I had a hunch it wasn’t “horse feathers” Tommy accused Cal of being full of. Anyway, that’s when Cal told Tommy that Peg was on her way to being as bad as Tess, and—I had to get this from one of the children too little to understand—it was all on account of their no-good teacher who thought she was a man and was likely to come to no good end. I felt real bad about that. Not because I was insulted, but because Tommy suffered for it. You see, that was when Tommy jumped Cal, who’s twice his age and darn near twice his size. Of course Cal laid him out fast, and then Wild Harry got mad. Tommy’s his little brother, and whatever else you might say about Harry, he understands family loyalty. It didn’t even matter he probably agreed with Cal. No one was going to knock down his little brother and get away with it. I got there just in time to see Harry jump over Tommy’s prostrate body and sail into Cal. I have to say, Harry had a more interesting line of insults than I’d have expected. Made me think, or would’ve if there’d been any time for thinking. Where Harry jumps, Jake follows, and Cal has his pals, so before long the whole square was a mess of fighting men. It looked like a disastrous end to our party—just a matter of time before two long tables holding what pies and cakes we hadn’t yet eaten got knocked over. I was debating joining the brawl, just to guard Tommy, who hadn’t moved, when a white-haired figure appeared in the midst of it all. Ninja or no, I figured him for a goner when he started commanding those crazy louts to stop. Cal and three of his pals stopped fighting with Harry and Jake, and turned on Tom. Harry and Jake knew better than to mess with the Ninja Librarian. They just stood and watched. I swear I saw Harry grin when Tom pulled that black silk mask from his pocket and put it on. By the time Cal reached him, Tom was set. One strike and two kicks later, Cal and his pals were on the ground, and Tom stood, relaxed and not even panting, while the others decided if they would or they wouldn’t. Apparently they weren’t too drunk to think, because they didn’t, and the riot dissolved as quickly as it had started. Most of the rioters slunk away to the creek to wash up. A few lay on the ground and didn’t get up. The more peaceful folks began crawling from under tables and behind wagons. The kids moved in on the pies and resumed feasting. The roar of the crowd—and a dipper of cold creek water—brought Tommy around. He sat up, a dazed grin on his face. Everyone laughed except Tom. He looked over the crowd and raised his voice again. A roar of laughter and agreement met the comment. It appeared that, once again, the Ninja Librarian had completely answered our questions. 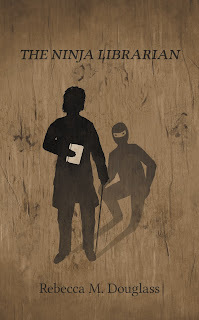 And if you enjoyed this excerpt, consider purchasing The Ninja Librarian or the sequel, Return to Skunk Corners--both reduced to 99 cents for the month of July! 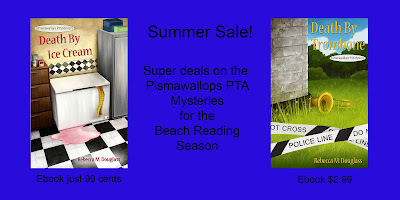 And finally--it's the very last day to get the Pismawallops PTA mysteries at summer fun prices!